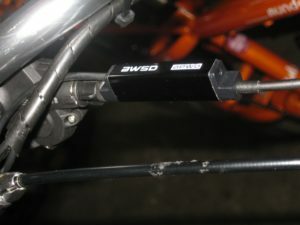 I ordered a Lekkie Gear Sensor from Bicycle Junction, which arrived this morning, and also a splitter cable so that I can connect it in. 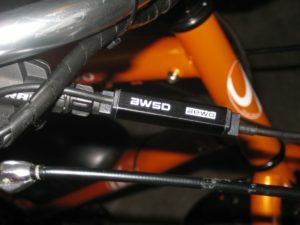 Because of the length of the cable (about 300mm), and the position of an appropriate place to plug it in, it is necessary to put it near the gear change, between the handlebars and the main tube of the frame. Most installation guides recommending splitting an outer cable guide, and placing the sensor between the two cut pieces. I chose to use a brake sensor adapter I had spare to fit it between the change lever and the cable. This is just a piece of plastic with two male ends, one to fit into the gear change lever, and one to fit into the gear sensor. So the first job is to completely remove the inner cable back as far as the lever. To do this you have to remove the end cap on the inner cable. Unfortunately, this leaves the inner cable slightly squashed, which causes problems threading through the gear sensor. I recommend completely removing and disposing of the old inner cable, and buying a new one. With a new cable, I threaded it back through the change lever, the adapter I mentioned, the gear sensor and then all the various parts of the outer cable and lugs etc, until it is reconnected to the derailleur, and then adjusted it. It sounds easy, but having spent quite a long time trying to thread a cable that was starting to fray, and having to remove the damaged cable when it all went wrong, and then a trip to the LBS for a new cable, it all took a couple of hours! Wiring it is is easy. Unplug the right hand brake sensor from the main loom, and plug in the Y adapter. Plug the brake sensor back into the Y cable, and the gear sensor into the other leg of the Y cable. Tidy up the cable runs, and it is all done, really simple. Anyway, it is all on and working. First impressions – well it is definitely much smoother changing gears. The motor shuts down just as the gears engage taking all the pressure of the drive chain at just the right time. Somewhat disconcerting is the quite significant delay until the motor kicks in again, and of course the “soft” start effect. It’s probably not too long a time, but when you are changing down on a steep hill, you can lose a lot of momentum. Overall, I think it will be better for the bike, if not for me. I will just need to change gear earlier. Incidentally, as I removed the old inner cable fron the gear sensor, the sensor came apart. Two things are instantly obvious. Firstly the main body of the device is aluminium extrusion, making it quite robust. Secondly, rather than a complicated mechanism which some sensors have, this one has a simple rectangular “carriage” that slides up and down a similarly shaped hole through the length of the device. Inside the carriage are two magnets. The carriage has a cable gripper through the middle of it, which makes the carriage move with the gear cable, but allows it to be positioned and removed etc. In the second cavity running the length of the device is a small circuit board, with an LED at one end, and a series of bumps down its length, covered with shrink wrap. These bumps are probably Hall sensors that will detect the moving carriage magnets, and hence the moving cable. I like the cleverness and simplicity of this design, it is really just a mores sophisticated version of the brake sensors I use on our other e-bikes. Hopefully it will give me many thousands of kilometres of hassle free gear changes. It went back together again easily, and works fine.